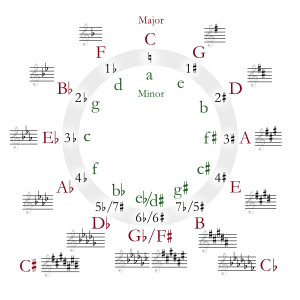 D♭ major (or D-flat major) is a major scale based on D♭. Its key signature has five flats. Its relative minor is B♭ minor, and its parallel minor is D♭ minor. This is usually replaced by C♯ minor because D♭ minor's eight flats (including the double-flat) make it generally impractical to use. Therefore, D♭ minor is often used as the parallel key of C♯ minor. For example, Chopin's Prelude No. 15 in D-flat major ("Raindrop"), modulates from D-flat major to C-sharp minor for the middle section in the parallel minor, and in his Fantaisie-Impromptu, primarily in C-sharp minor, Chopin switches to D-flat major for the middle section for the opposite reason. Claude Debussy also switches from D-flat major to C-sharp minor in the significant section in his famous Clair de lune. Antonín Dvořák's New World Symphony likewise switches to C-sharp minor for a while for the significant section in the slow movement. This page was last changed on 8 August 2016, at 18:51.